Expert bike geometry designed to comfortably position first-time riders with two hands on the handlebars, bum on the saddle and feet on the ground. Features include front and rear child specific hand brakes, adjustable saddle height, pneumatic tires, internal brake cable routing. Slim, junior race-style vegan leather saddle designed to maximize a rider’s range of motion while minimizing chafing. Grips, handlebars and brake levers designed for the littlest hands. Ridiculously light at just 12 pounds. Available in Super Cream, Sorta Pink and Very Orange. An extremely lightweight kids bike for girls or boys, weighing just 15 lbs for the coaster brake model or 13 lbs for the freewheel model. Front and rear child-specific hand brakes on both coaster brake model, and freewheel model help keep your kid comfortable and safe when riding. Bike geometry designed for first-time riders to sit on the seat with their feet safely planted on the ground. Seat height and reach to the handlebars are adjustable with one bolt, to easily optimize the fit. The Hedgehog is a "do anything" bike. Kids can drop down stairs, tackle technical trails or hunt for caterpillars in the neighborhood. The bike has no rider weight limit, so when your child has gone to sleep after a day of riding, take the Hedgehog for a spin. You'll see how fun it is. Fits riders with an inseam of 17" to 21". First time riders feel safest with their bottom on the saddle and their feet flat on the ground. That's how a child with an 18" inseam will fit the Hedgehog with the seat post dropped as low as possible. Once kids get more comfortable on two wheels, they'll want to sit on the saddle with the balls of their feet on the ground. 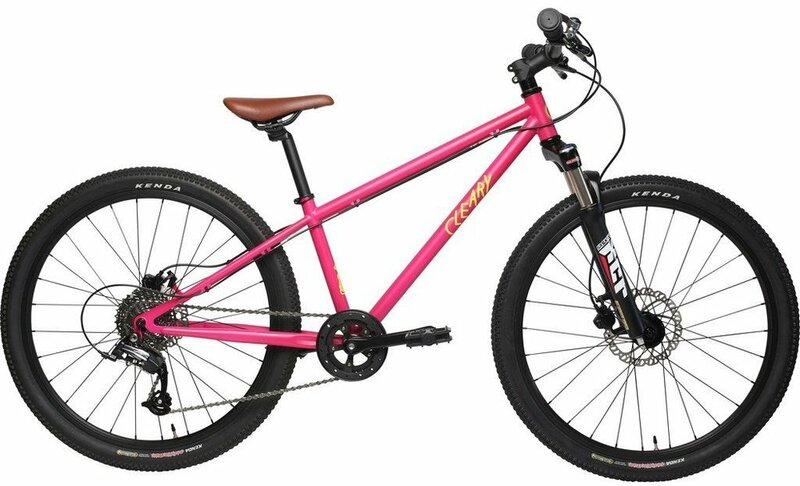 Features include front and rear child-specific hand brakes, 5mm Allen skewer on front wheel, single speed drive train, internal brake cable routing as well as grips, handlebars and brake levers designed for small hands. Flip-flop rear hub allows for choice of rear cog on freewheel model, for customized gear ratio. Three-piece crank and square taper bottom bracket. Expert bike geometry centers weight between the rider’s hands and seat, which creates a stable, quick-handling bike. Strong Tektro V-Brakes, front and rear plus grips, riser handlebars and brake levers designed for small hands. Single speed drivetrain features 32x19 gear ratio. Reinforced steel fork is wider to accept knobby mountain bike tires up to 2.125" for extreme off-road use. Includes internal brake cable routing, water Bottle cage mounts on down tube, three-piece crank and square taper bottom bracket. First time riders feel safest with their bottom on the saddle and their feet flat on the ground. That's how a child with a 21" inseam will fit the Owl with the seat post dropped as low as possible. Once kids get more comfortable on two wheels, they'll want to sit on the saddle with the balls of their feet on the ground. Cleary now makes a 3-speed version of the Owl with an internally geared three speed hub. Meerkat geometry balances a rider's weight evenly between her hands and seat, which creates a stable, quick-handling bike, ideal for children ages 7-12 years old between 48" - 60" (4' - 5') in height, and with an inseam length ranging from 21"- 26". Bike weights 25.5 lbs and features front and rear hydraulic disc brakes, a 1x9 drivetrain with MicroShift thumb shifter and medium cage derailleur (trigger shifter available). Includes a Suntour XCR 24” (63mm Travel) Air Suspension Fork.